His name was Giuseppe Siri and he became an Italian Cardinal of the Catholic Church and served as Archbishop of Genoa from 1946 to 1987. In 1953, before his death, Pope Pius XII elevated Cardinal Siri to the Cardinalate and named him as his “desired successor” to the papacy. After Pope Pius XII died in October, 1958 the stage was set for the selection of his successor. Thus the cardinals from around the world came to Italy and, by tradition, were locked away in the Sistine Chapel to elect a new pope. As expected, Siri was elected on the third ballot. It was said he took the name Pope Gregory XVII. White smoke was observed coming from the chapel chimney and the news broke that a new pope was chosen. The Swiss Guards were alerted. People gathered for the new pope to appear at the windows of the apostolic palace. But nothing happened. Suddenly black smoke began pouring from the chimney. Something odd was occurring. It appears that there were some strong opponents to Siri’s appointment. Like all gatherings of powerful people from international circles, the cardinals were politically oriented. Thus there was a gang of progressives including the Polish Cardinal Stefan Wyszynski, Cardinal Oswald Gracias of India, and Cardinals Giacomo Lercaro and Angelo Guiseppe Roncalli, both of Italy. We will never know the full extent of the in-fighting that occurred at that conclave. People gathered outside the palace and stood in bewilderment for three days. Then the white smoke was seen again. This time the 78-year-old Roncalli appeared in the window. He took the name Pope John XXIII. It turned out that the progressive cardinals managed to “convince” Siri to step down for a compromise candidate. This was for interesting political reasons. It seems that the church within the Soviet Union, which had been operating under Stalin and Pius XII, was opposed to Siri because of his strong anti-Communist position. The cardinals feared a warning by the Soviets, under Khrushchev, that Siri’s election would usher in a wave of expulsions and separate the church operating under the Vatican. Thus Pope John XXIII came into existence and Pope Gregory XVII was never given the vestments of the office. Strangely, Roncalli was recorded as the second pope in Rome to assume the name John XXIII. A pope by this name allegedly sat on the papacy briefly from 1410 to 1415. He was Baldassarre Cossa, regarded by the church as an “antipope” who was involved in a peculiar division when three separate men assumed the title of pope. He was eventually deposed and tried for various crimes, including charges of piracy. 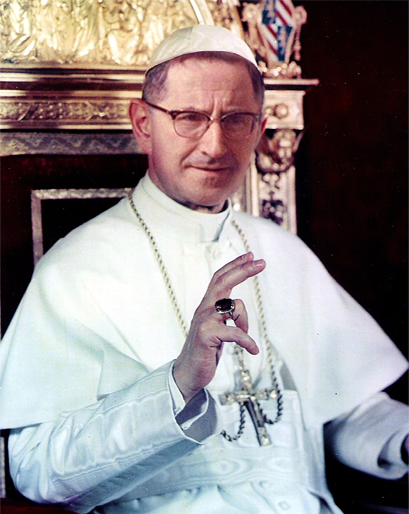 The 1958 “secret” conclave occurred while the Roman Catholic Church was operating under the influence of the Jesuits. This may be a significant because this was an early glimpse of a possible split in Catholic ideology that may have been the start of an effort to rid the church of Jesuit control. It was Spellman who stood among the Cardinals that also opposed Siri’s election.